Our dogs have such very different personalities! The beagle believes it is easier to ask forgiveness than permission. He lives in the moment – which is great when I’ve yelled at him unfairly and not so great when I’m trying to teach him something. He loves his outside time and will spend hours at in the yard, whether snoozing under a tree, checking the perimeter, or woo-wooing at something. At some point though, the yard is uninteresting because it’s time to recharge with a nap. He’s more active than the other two dogs and more in need of his sleep when he’s tired. This is such a contrast to our pretty boy who wants to be the “good boy” and needs permission before he does anything. If he gets yelled at, he becomes timid. He loves the couch and has plenty of energy at the end of the day – he’s not ready to collapse from being outside taking care of the yard! 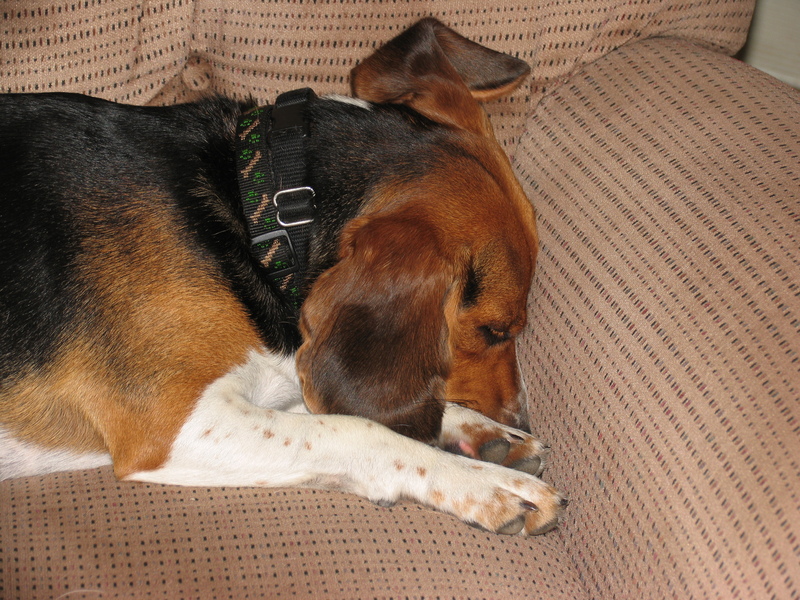 The beagle is wearing two collars here – his regular one and the one for the electronic fence that we had in Omaha. Word for tomorrow – LICENSE. If you prefer to work ahead, see the list for the week under “A Word A Day”. There is something so endearing about our pets taking a nap. There really is something so cute about them sleeping! Sleeping pets are like sleeping children – so sweet and innocent.